I never tire of this view when I get the chance. The light is never the same twice. Here the air is so clear you can see the hills of the Forest of Bowland sharply delineated on the horizon. It’s been a long time but it’s a new year and it’s the fifth anniversary of this blog, so it’s time to chronicle the fine town of Barrow with a photo a day again. To start afresh, here’s a shot of the waves on the beach at Sandy Gap. A grand day out all round. More pictures of the event here. It was a long walk home last night (but what a walk!) 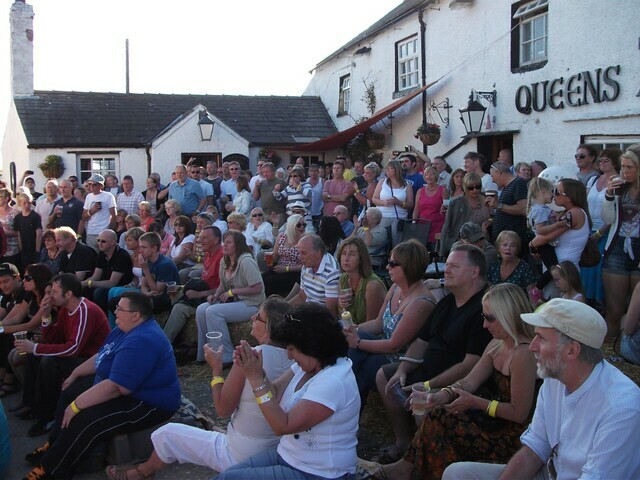 from the Queens Arms Music Festival at Biggar. I took this picture from the Walney Bridge at a few minutes past 1 am, with a near spring tide an hour from the full and a panorama of Lakeland fells from Scafell on the left to Wetherlam on the right silhouetted against the sky above the streetlights that run from centre to right. I wanted to show how, in Barrow at this time of year, it never gets completely dark. 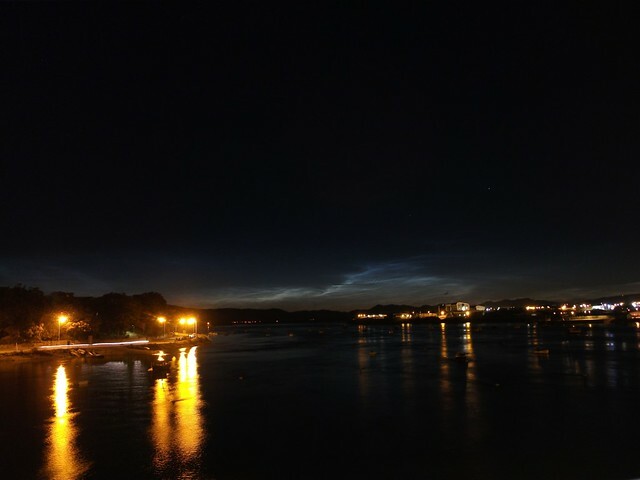 But apparently those shiny clouds that seem to form a halo round Scafell are noctilucent clouds, a phenomenon that people go out to look for because they are quite rare. They are the reflections of a sun just below the northern horizon from ice crystals high in the atmosphere; in fact they are the highest clouds observable in the earth’s atmosphere. I guess I just got lucky. Not, in fact, Little Gulls (Larus minutus) but chicks of our old friend Barrow’s own gull, the Lesser Black-Backed (L Fuscus). I reckon these two are about two weeks old and are only just beginning to acquire their wing feathers. I noted in my private journal that I saw the first chicks, as tiny, spotty balls of fluff, on 25 May. 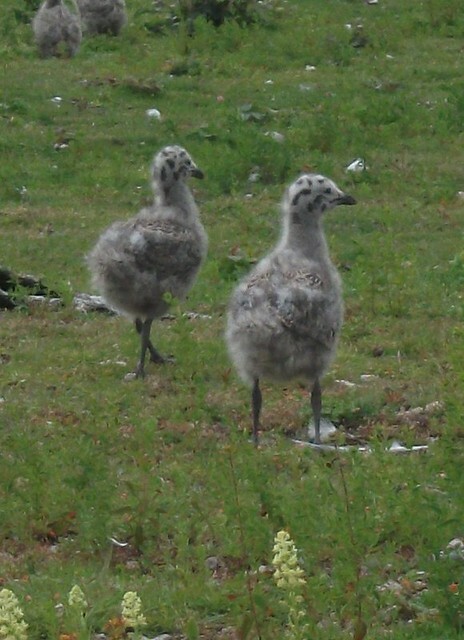 I’ve been watching them just about every day since; those first chicks are now, less than four weeks on, as big as their parents, have their flight feathers, and are almost ready to start jumping up and down trying to fly. That won’t take long and by August they’ll be swooping round the docks, getting ready to fly to the Mediterranean in September. The gull colony shares their space – former railway sidings now kept surrounded by razor wire as a cordon sanitaire by the shipyard – with a warren of rabbits. The rabbits and the gulls get along just fine, but let a magpie in and there’s sure to be trouble. They aren’t madly keen on humans with cameras getting too close either so one has to take the chance when one can. I felt like being creative at the weekend. 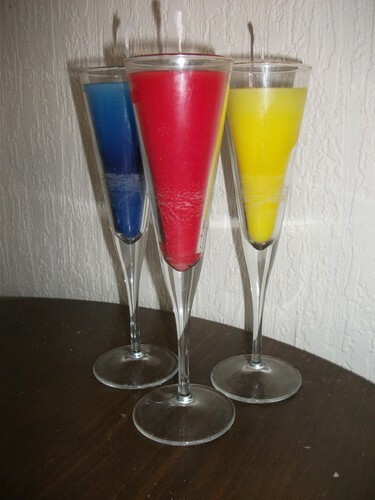 Three cheap wine glasses that don’t fit in any of my cupboards, a box of Price’s utility candles, and some wax crayons produced this colourful trio. I could enjoy this kind of thing. I could even make them for sale, maybe. What do you think? Tomorrow night I’m hosting the Friday Quiz at the Queens Arms, Biggar so any spare time I’ve had today has been devoted to devising fiendish questions to flummox the punters. If you’re in the area why not come along? The quiz is always good fun. 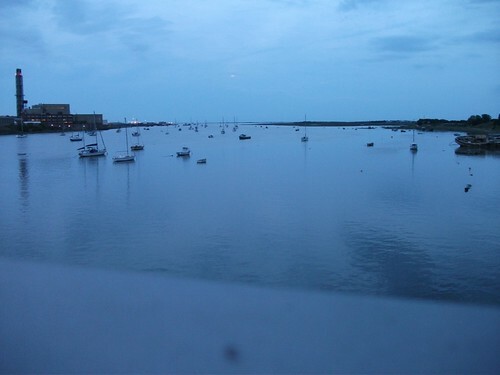 So in the absence of a fresh photo here’s another take on one of my favourite subjects; the view from the Walney Bridge. This time on a high tide at twilight. Enjoy! I was back bowling in the league today, after a three-week layoff brought about by two successive byes, which seems to me like bad planning on the part of the league but who am I to judge? 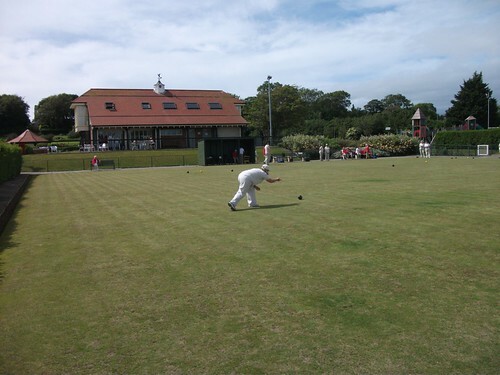 And what better way is there to spend a pleasant summer afternoon than on the bowling green? Today’s match brought the bottle-green and cream (though today most of us stripped off the bottle-green and played in cream shirts) of the Barrow Island team face to face with Park North, whose home green is one of those in Barrow Park. I enjoyed a 21-9 win so I get to keep my place in the team at least for now. I have a bad habit of winning every other game. Playing in the park got me thinking. When I was young, even into early adulthood, public bowling greens were one of the things public parks offered. You could hire a set of woods for the session for a nominal fee and enjoy an hour or so on the green. My parents used to to exactly that. If you wanted to try out bowls it was an inexpensive way to find out if it was for you. Looking around it looks as though Barrow Park boasted at least six greens and I can imagine if my experience elsewhere is anything to go by that they were well used on a sunny summer evening by casual players. Now, one of those has been turned into flower beds, two are abandoned and neglected, two are the preserve of the Park North and Furness Abbey teams respectively, and one is open for public hire (although I’ve never seen anybody playing on it). It is no longer possible to hire woods, so you can’t just try it out. The crown-green bowler only needs two woods, as opposed to the the flat bowler’s four, and if you keep your eyes peeled you might pick up a second-hand set for twenty pounds or so, but that seems a lot for a pensioner, or somebody on benefits, to try out. And that reminds me of another thing – bowls is a game of guile and concentration and judgement; it doesn’t demand youth or physical agility so players can complete well into one’s senior years. It’s a great way for older people to keep fit, and it does seem to work very effectively. I should note that there are some very good teenage players indeed (it’s galling to get a thrashing from a 13-year-old) and it’s great that young people continue to play but the sad truth is that bowls is dying. Almost all the pub greens have gone the way of the municipal greens, sold off for housing or car parking, and only the private clubs survive, some of them barely. It would be sad indeed if this seriously addictive game were to die. And another thing. There are no municipal tennis courts in any of Barrows parks any more. I don’t know what the situation is in the rest of the country. Next Monday comes one of the great British summer rituals, the opening of the Wimbledon Fortnight. And on Tuesday, when all the British players bar Andy Murray (I hope) have been eliminated, comes another regular ritual; asking what’s wrong with the state of British tennis. Well, I can answer that – there’s no longer the opportunity for anybody to play a casual game of tennis, unless they join a tennis club, and that never comes cheap. The local park used to provide that opportunity. Now local authorities can’t be bothered providing them. 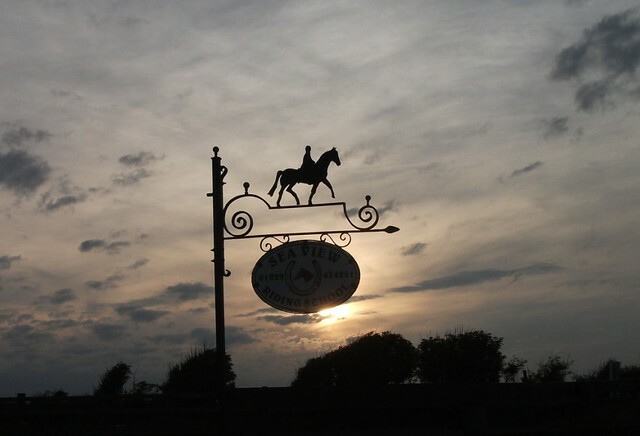 I caught this shot of the sign outside the riding school at Biggar, on Walney, last night as I was leaving the pub. The sky was absolutely terrific and the light quite magical. Have I mentioned that I’m now hanging out here? The little village – barely a hamlet actually – of Biggar is a bit of an oddity. It’s one of the original farming settlements on Walney, and it’s been there since long before Barrow existed, never mind there being a bridge over to Walney. It sits huddled against the saltmarshes of the Walney Channel and before the bridge, before the ferry, the only way to the mainland was by boat or by walking across a causeway at low tide. Even now it feels a bit weird, with an end-of-all-things atmosphere in its remote isolation. But like all of Walney it remains firmly within the Borough of Barrow-in-Furness, as it was in the old County Borough before that. There’s no bus service; it’s either a car along one of two narrow lanes or a half-hour walk from Ocean Road, and perhaps that’s why it’s been colonised by some of Barrow’s most affluent residents. The only reason non-residents might want to visit has been the Queens Arms. Its location was its unique selling point and its location is superb with its proximity to the beach, stunning views and general sense of rus in urbem, but in recent years it hadn’t been much more than just ok. It did a reasonable if unadventurous evening meal but the beer was only so-so and the atmosphere not particularly welcoming. In the end, a couple of years ago, it closed. It stayed closed for over a year. And then something remarkable happened. Two women, Mary Rudkin and Julie Matthews, from Bolton were tipped off about the vacant property by a friend. 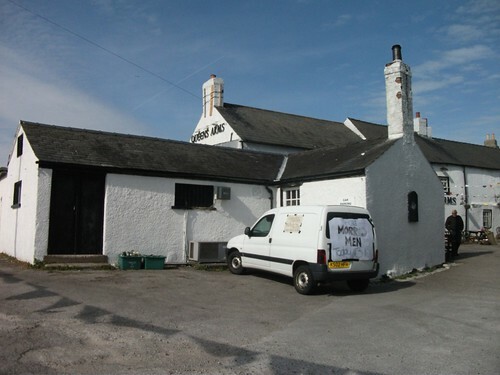 Neither had any experience of running a pub, but they threw themselves into reviving the Queens Arms with gusto. Out went the tat provided by the brewery and pubco marketing people. In came an assortment of genuine bric-a-brac, a piano, books, games, jigsaws, and a bank of six handpumps. It took me until a warm Saturday at the beginning of April when I diverted from the beach to check out what was happening, and barely had I stepped inside the door and ordered a pint of locally-brewed beer than I felt like an old friend dropping in. Local children were engaged in making bunting – not your average red, white and blue bunting but bunting made of scraps of old dresses and curtains. I picked up a programme of events and my eyes nearly popped out. There are Friday quizzes, a book club, a film club, an art class (Mary, an artist, is considering turning derelict outbuildings into an art gallery), a “knit and knatter” night, and the pièce de résistance the Wednesday night buffets, where everybody shares a table and for a modest GBP 15.00 gets what they are given; an imaginative four-course meal provided by Julie, often using produce from the garden or foraged from the local hedgerows. (I haven’t tried this yet but I’m lining it up for my birthday treat in August). If you want to try this, and from what I hear it’s worth every penny, phone Julie or Mary on 01229 471880. No, they haven’t paid me for this item. It really has become a special kind of place, and although it takes me an hour to walk there of an evening (but what a walk!) it’s definitely my local from now on. As it happens I’m going there tonight, it’s now the venue for my new writers group, the Regal Writers, and we’re having our second meeting there this evening.